The Alban Institute expands its look at how congregations tackle the issue of money as it relates to faith and lifestyles. Several renowned experts offer fresh perspectives on various aspects of this issue, with innovative ideas and solutions for congregations and their leaders. Along with previous Money, Faith, and Lifestyle titles, the new series entries offer something for everyone concerned about this most pressing issue.Intentionally provocative, Alban founder and former president Loren Mead's dynamic work sets out dramatic and compelling challenges for today's churches. Mead chose the word "melt-down" -- a strong term, indeed -- very carefully and consciously. His clarion call urges congregations to direct attention to their dwindling financial resources and their unreliable fiscal practices, and to take major action now -- or face disaster in the future. Mead addresses changing church giving patterns; the inconsistent ways congregations keep financial records; the lack of coordinated short- and long-range planning; the need for knowledge of sound financial techniques such as accounting for inflation; an over-reliance on "restructuring" to fix problems; and lack of defensive planning for operational costs. 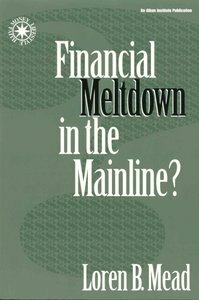 About "Financial Meltdown in the Mainline?"